One of the most essential parts about a road trip is careful planning, and what turns a normal drive into a “road trip” are sometimes silly and downright awesome stops along the way. Going to a music festival should be more than just experiencing music, it should be about living in the moment, having new adventures, and taking off on journeys of self-discovery. 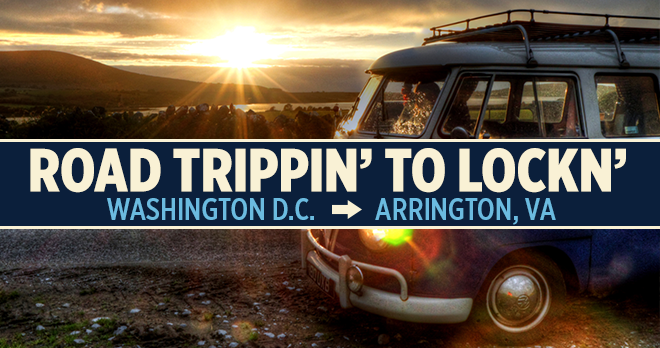 As you start planning for this year’s LOCKN’, we’re here to help get you get on the road and make some memories. The United States Botanical Gardens is a living museum. Established by Congress in 1820, the garden is the oldest botanic garden in North America. Here you can immerse yourself in beauty and contemplate the adventure ahead of you. One of the many wonders of the modern world is a giant roller skate made entirely of wood and plaster. Doesn’t this seem like the perfect place to stop for a selfie? Directly located on the route down to Arrington on Brandy Road, the Graffiti house is a tiny, quaint, old storefront turned hospital that was used for both Union and Confederate soldiers during the Civil War. Why is it called the Graffiti House? The entire inside of the house is decorated in cryptic messages and inscriptions from soldiers who were either staying or just passing by. Talk about a time capsule! A revered national park, Shenandoah offers spectacular views of the blue ridge mountains at Stony Man overlook. This National park is a great adventure for beginning hikers/adventurers and experienced ones alike. Waterfalls, humpback rocks, and grassy mountains make for an unforgettable experience. As America’s oldest continuously operated show cave, this gorgeous cave was voted #2 in America by Parade magazine, and is a National Natural Landmark. History and beauty combine inside this grand cave. We’re sure you probably need a beer or two by now, so it’s pretty lucky that you’re jouney has taken you to the Blue Mountain Brewery. As one of the best brewpubs in the area, this location offers a wonderful location near the Blue Ridge Mountains, a tasty selection of beers, and scrumptious food. You’ve made it! You’ve arrived at LOCKN’ Festival and it’s time to celebrate your journey and all that you’ve accomplished. You’re at your new home for four days. Now, go set up, meet your neighbors, and have fun!